With kids around, you can’t be postponing any pest control measures because, for obvious reasons, it’s not safe nor sanitary to have children living in a pest-infested home. Whether it’s a minor ant problem, roaches, or some pesky rats that keep invading your kitchen at night, if you suspect there might be a pest problem in your home, it’s a good idea to have a professional come inspect and eradicate any issues just to be on the safe side. According to Go-Forth Pest Control of Charlotte, a significant percentage of their clients are concerned parents trying to maintain a safe environment for their kids. Power outlets can be highly dangerous electrocution and shock hazards for kids, whether something is plugged into the outlet or not. 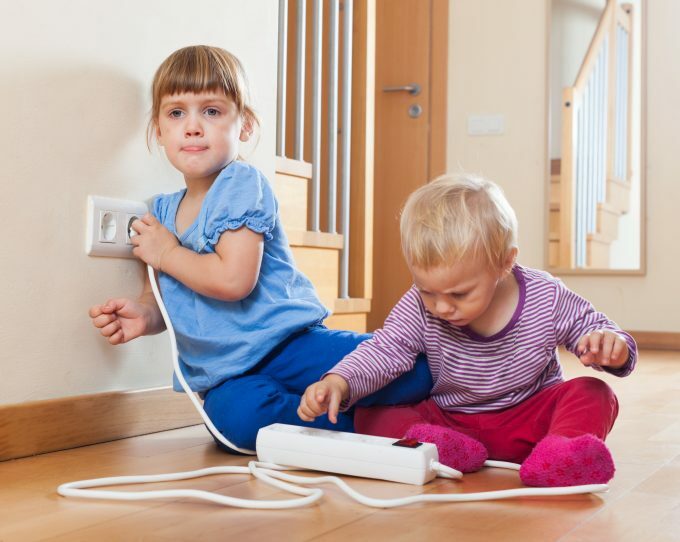 If a child pulls a plug out of the wall while a device or appliance is in use, there’s live current running through it, and if they touch the spark that comes out, the consequences could be horrible. Children can also be shocked by simply sticking something metal into the outlet holes. Thus, many parents use outlet stoppers to keep mischievous and curious hands out of danger. It’s also a good idea to keep children out of the room completely when using high-powered appliances like tools and cleaning equipment. Ideally, everyone with children should have a fenced in front and/or back yard to give their children a safe place to run around and be themselves without worrying whether they’ll accidentally run out into traffic or wander off into the neighborhood. Of course, nothing replaces solid supervision, but there are those cases when you just can’t hop off of the porch quick enough, and having a fence there to keep the kids contained ensures that they won’t surprise you by suddenly dashing into the street or chasing a cat into another yard. It’s also very important to make sure the fence latches and the locking mechanisms are childproof and locked at all times. As soon as children learn how to open door knobs, you instantly have a major concern on your hands. No door is safe from being opened at any given time, including the doors that exit your home or lead to potentially dangerous areas like the bathroom, laundry room, or garage. Confining kids to a designated play area using a playpen or other containment is one option, but eventually you’ll have to let them out of there, and when you do, you don’t want them trying to open every door they see. The solution is to use childproof door knob covers. These wonderful childproofing inventions wrap around the door knob and make it so that only an adult can insert their fingers into the grip holes to turn the knob. However, the downside is that opening doors with these pesky contraptions attached can take some getting used to, but it’s not so bad once you’ve got the hang of it. Kids are always falling over and bumping into things – it’s how they learn to keep their balance and avoid collisions. Unfortunately, letting them “learn the hard way” can be a really bad idea if you’ve got particularly hazardous pieces of furniture or other objects in your home. Falling onto one of these surfaces the wrong way could be downright disastrous, so it’s best to not have them around at all. That doesn’t mean you have to get rid of your current furniture, but it would at least be wise to cover the corners and other problem areas with cushions. There are kid safety cushions that are designed to be added to things like couches and tables. Purchasing some of these cushions and/or rearranging furniture are crucial investments of your time and money when you consider the type of injury you could be preventing. Kids love to play out in the yard, but having a fence isn’t the only safety measure you should be taking. Depending on your area and how the yard has been maintained by previous residents and lawn services, there could be any number of hazards waiting to cause problems for your little ones. Look for things like fire ant infestations, broken pieces of glass, areas that contain prickly things, hidden holes, uneven dips and mounds, and signs of previous usage of chemical lawn treatment products. It may be best to water the lawn a few times and conduct a thorough examination of the grass before letting the kids play in it. It’s also best to have a designated sandbox to keep them from wanting to dig up the yard, which of course is not only filthy and unsightly, but also presents the possibility of them encountering bugs, germs, sharp objects, and weed killer residue. You don’t want your little ones turning on the stovetop or oven unnoticed as it could literally burn down the house. Likewise, you don’t want them messing with the washer and dryer buttons and doors either because they could accidentally lock a sibling in and activate a cycle. These are things that might seem far-fetched, but they’ve happened to many unfortunate families. Don’t take the risk that your kids will be able to cause harm to themselves or your property. Instead, use baby gates and childproof appliances to keep them from accessing and using appliance controls. Many washer and dryers have a “button lock” option that you can hold down for a few seconds to deactivate all controls. Nobody should have to tell a parent that stairs can be very dangerous kids, but at the same time there are many families who live in townhomes and other multi-level housing types, so stairs become a normal part of everyday life and can therefore be overlooked when it comes to taking safety precautions. Younger children should be kept from going up and down the stairs altogether by placing secured baby gates at the top and bottom of the stairs. Older kids should be instructed not to run on the stairs or remove baby gates without an adult’s permission and should be taught the importance of using the handrails for support. Fireplaces and woodstoves present a serious dilemma for many parents who would love to use them, but are afraid to for fear that the kids could get hurt. Indeed, it’s reasonable to want to protect your kids from an open fire, but on the other hand children typically don’t just jump headfirst into flames, so it’s not as if your little ones will just waltz right into the fire without knowing what’s going on. However, the concern is that they could accidentally fall into the fire or throw something in there that isn’t supposed to be burned. With most households containing flammable and combustible products, having kids around an active fireplace or woodstove is a recipe for disaster if the right steps aren’t taken. One of the best options is to get a hearth safety gate to cover the entire area with a containment that is fire-resistant and sturdy enough to hold up against the advances or a rowdy kid. Any body of water represents a drowning hazard for kids, which is why it’s so important to have a well-secured pool area. Hot tubs and even bathtubs are hazards as well, so it’s important to make sure they’re never left full of water and that the kids don’t have access to them unattended. Pool gate alarms and door exit alarms are great ways to be notified when someone enters the pool area. Pool surface alarms are also good second lines of defense to let you know when something or someone has entered the pool itself. Ultimately, taking steps to address the concerns listed above will not only keep your kids safe, it will also give you the peace of mind that you’ve got everything adequately covered and protected around the house. It may take a bit of research and a few new products to complete the childproofing process, but once you’re done, you won’t find yourself scurrying to stop or fix trouble that could have easily been prevented in the first place.